Retirement Savings Calculator - How to Save a Million? Retirement Savings Calculator – How to Save a Million? Planning for retirement is made easier than before by utilizing a simple retirement savings calculator that does not involve any complicated spreadsheets of confusing financial data. All you need to do is answer a series of simple questions and have a retirement planning calculator do all the work for you. Whether you would like to save a million or simply want to have adequate retirement cash flow at a certain age, retirement savings calculator will be able to do all the math for you at no cost. Before you proceed with the retirement savings calculator, you might need to gather all the current information on your income, the income of your spouse, all existing retirement savings, brokerage accounts, mortgage, home value amounts and average life expectancy in your immediate family. All these numbers are going to be the starting point for the retirement savings calculator to plan your anticipated retirement cash flow and determine how much more money you need to be contributing into your existing retirement accounts or 401K. Contact your employer to find out what your 401K contribution limits are according to the policy of your specific 401K plan. Be advised that if you are approaching the age 50, you might be qualified for 401K catch up contributions that were established to be $5,500 for the year of 2010 if your employer offers them. This provision will allow you to contribute more money into your 401K beyond the regular 401K contribution limits once you reach age 50. Using simple retirement savings calculator and planning for your retirement way in advance will ensure you a comfortable life after you retire and lower your risk of running out of your retirement savings. Some retirement planning calculators will even make suggestions on how to optimize your retirement portfolio. Let’s assume you are already contributing a maximum to your 401K or a Roth IRA accounts and still have some cash left over that you would like to invest on the after tax basis so it grows by the time you retire. Why not consider investing in low initial investment mutual funds? Some low initial investment mutual funds will allow you to start participating with as low as $100 to a $1,000. 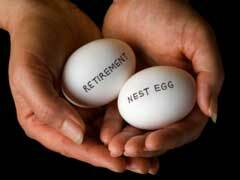 Retirement Savings Account Types: 7 Things To Remember! Vanguard Retirement Savings Trust - Safe Investment or Not?